The pharma unit of J&J launched the Cancer.com website this week. HORSHAM, PA: Johnson & Johnson’s pharmaceutical arm is trying to make it easier for someone looking for information about cancer to find it on the first web address that comes to mind: Cancer.com. Janssen launched the portal on Wednesday to support patients and caregivers on the cancer journey from diagnosis and remission to wellness and community support. The pharma company isn’t relying solely on the straightforward URL to reach cancer patients. It also partnered with the American Cancer Society, CancerCare, and Cancer Support Community to ensure patients can find and use Cancer.com’s resources. "Having the URL alone of Cancer.com, we know patients are going to begin to find the website and the partnerships with advocacy organizations," said Leslie Amendola, senior director of oncology franchise strategy at Janssen Oncology. "We intend to extend beyond the three [organizations] and build it up over time. We recently met with 50 members of the oncology advocacy community that we hope can share Cancer.com with their communities as well." The website is chock full of cancer content, mostly aggregated cancer-related news stories from around the web and partner organizations. 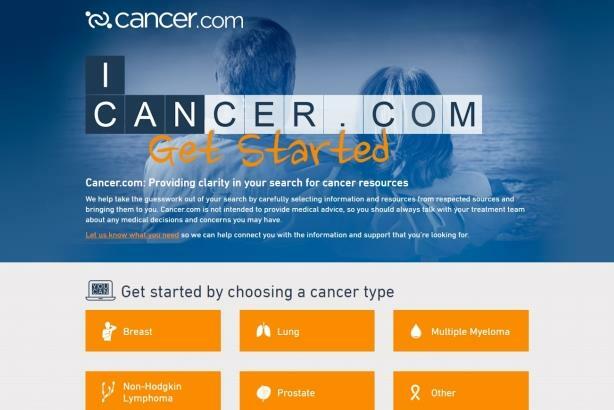 At its launch, Cancer.com has content for some of most commonly diagnosed cancers: breast cancer, lung cancer, multiple myeloma, prostate cancer, and non-Hodgkin lymphoma. It also separates the content into the stages of a cancer diagnosis, from recently diagnosed to remission to recurrence. A patient can find a page as specific as making treatment decisions for non-Hodgkin lymphoma that lists the drugs and therapies used to treat the disease. However, Janssen hopes that people who don’t have one of the five cancers covered on the site can also find resources. Much of the content comes from the partner organizations and the National Cancer Institute, with some aggregated news from credible sources like Mayo Clinic, HealthDay, or Cleveland Clinic. "We wanted to help because you can be overwhelmed with the amount of information out there [about cancer]," Amendola said. "Much of which is credible and some of which isn't." The website has been in the works for years, Amendola said, and the three advocacy organizations have been involved since day one to develop the content strategy based on market research and experience with patients. The website also allows patients and caregivers to customize their content by inputting their cancer diagnosis and where they are in the treatment process. "Pharma companies often bring branded initiatives to the community and do them through traditional means, but to be able to provide something that is truly empowering, we need that partnership with the advocacy community," Amendola said.